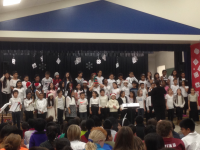 The Holiday Sing at June’s school was the subject of unexpected controversy this year. First the times for the performances changed and parents who had taken time off work were inconvenienced. There was quite the hullabaloo about it on the PTA listerv. You wouldn’t believe it, unless you’ve ever read a PTA listerv, in which case it was just about what you’d expect. 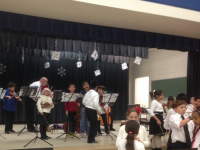 After some discontent about the schedule change and how the event is publicized in general, it eventually turned into a critique, by a kindergarten parent, about the whole format of the Holiday Sing, in which fourth and fifth-graders in orchestra, band, and chorus perform and kids in the younger grades participate in a sing-along. I think what it comes down to, for some parents anyway, was a desire for it to be more like the elementary school holiday concerts of our youth, with every kid in the school up on risers and singing for parents. But June’s school has nine hundred students. That’s just not going to work. Even as it is, they have to do the Holiday Sing over the course of two days, in three shifts, one for an audience of kindergartens and first graders, one for the second and third grade and one for fourth and fifth grade students who aren’t taking instrumental music or chorus. I think the pre-K gets split in half, as some attend school in the morning and some in the afternoon. In my opinion, it’s actually a pretty elegant solution. There are advantages to having only the students who’ve shown enough interest in music to join band, orchestra, or chorus perform. (I will discreetly let you imagine what these are.) In fact, it’s not even the whole band and orchestra that play. Just fifth graders, advanced fourth graders, and a few beginning fourth graders who play needed instruments. Yet with the sing-along component, everyone gets to participate, even if the kids are sitting on the floor, facing the stage so their parents sitting on folding chairs at the back of the room can only see the backs of their heads (and sometimes their hands if the song has hand motions). Anyway, being a veteran elementary school parent, I knew what to expect from the Holiday Sing. And it was a big deal for June this year because after years of anticipation, she was finally old enough to be on stage. And she’d be there over and over because she’s in orchestra and chorus. The chorus started practicing the Hanukkah, Christmas, and Kwanzaa songs back in September. The orchestra songs, “Skaters’ Waltz” and “Sleigh Ride” were merely wintry, rather than holiday-themed because they are going to perform them again at their full-length concert in late January. June was excited in the days leading up to the concert. The weekend we were in Rehoboth Beth took her to the outlets and bought her an outfit to wear—a white cowl-necked sweater, a black pleated skirt, black tights with rhinestones, and shiny black shoes, with costume jewels on the toes. I had suggested making do with a white cardigan, navy skirt, and navy leggings she already owned but I was apparently missing the point of the concert dress code—new clothes. (She did wear the other outfit on the second day she performed because she didn’t want to go to school in the same outfit two days in a row, another thing I failed to understand.) As a final touch, she donned a Santa hat, as did a few other musicians and singers. June also had a preference for which performance she wanted us to attend. The chorus was singing different songs at different shifts and they were only doing her favorite song, “Little Saint Nick,” at the fourth and fifth grade show, on Thursday afternoon. Thursday was a tricky day for Beth, as there was a board meeting she needed prepare for, and there was also a press conference to announce her union was endorsing Bernie Sanders. She said she’d do her best to come, but she couldn’t promise. I didn’t know if she was coming until I got a text from her twenty-five minutes before I left the house, saying she was leaving her office. I met her inside the school. She’d saved a seat in the front row. So we sat and watched the kids take their places. We’ve been to a lot of elementary and middle school band concerts since Noah started to play percussion five years ago, so all the group kids in the black and white dress clothes milling around up on stage was a familiar sight, but there were a couple of differences. 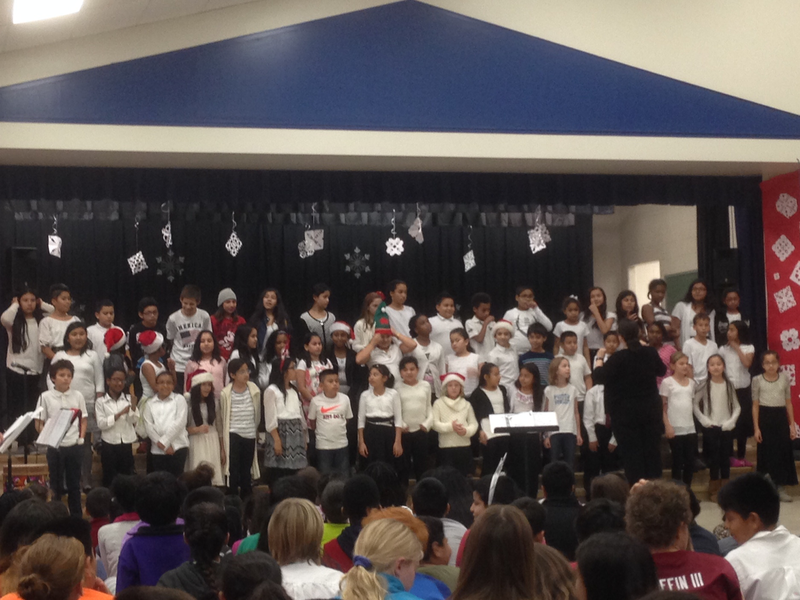 For one, because Noah switched elementary schools after third grade, he never played at this school’s Holiday Sing. More importantly, though, for the first time, the kid up on stage with an instrument was June. “She’s growing up,” I whispered to Beth, and then we both cried a little. The band and orchestra alternated songs. The brass instruments played first. We knew two of the trumpet players and one of the saxophonists from June’s bus stop. (One was probably wearing a hand-me-down band shirt of Noah’s.) The orchestra had two songs and the second one in particular “Sleigh Ride” sounded really good. June looked very serious as she played. After the instrumental music was over, the chorus sang three songs alone (“Winter Wonderland,” “The Eight Days of Hanukkah,” and “Blitzen’s Boogie”) and then nine more with audience participation. June may have liked “Little Saint Nick” best but the kids in the audience went crazy for “Rudolf the Red-Nosed Reindeer.” They always do. There was also quite a commotion when it was announced any teacher who wanted to wear reindeer antlers during the sing-along could. All the kids were clamoring for their teachers to go get some and a few of them did. There are always at least a couple songs in Spanish (or Ladino) because of the large Spanish-speaking population at June’s school and its Spanish immersion program. This year it was “Ocho Kandelikas” and “Dale Dale Dale.” Another of the Hanukkah songs was in Hebrew and one of the Kwanzaa songs was partially in Swahili, so it was all quite international. The program was over in about forty-five minutes. Then June went to an abbreviated gym class (in her dress clothes) and Beth and I headed home. 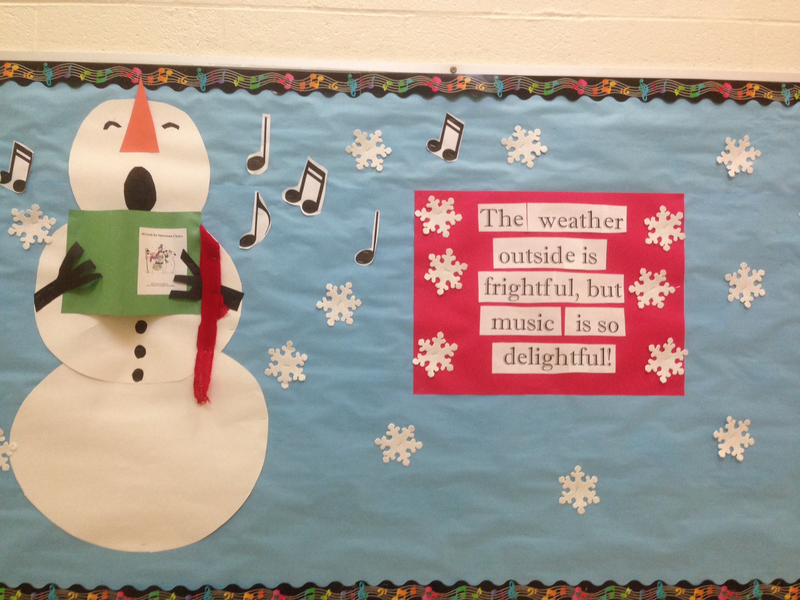 On the way out, Beth snapped a picture of a bulletin board promoting the Holiday Sing. 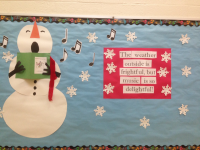 It said, “The weather outside is frightful, but music is so delightful.” We haven’t had much wintry weather yet this year—the day of the Holiday Sing it was in the fifties and raining, but watching our kids play and sing is always delightful. That never changes. This entry was posted in Extracurricular Activities, Holidays by Steph. Bookmark the permalink.